The women of the Sagar Nagar slum outside Kanbargi lacked access to reliable income, often forced to rely on money made through their own and their children’s begging, making them highly vulnerable to socio-economic shocks. The slum they lived within additionally had no access to electricity, education nor basic health services, inhibiting their and their families’ daily lives and economic potential. These challenges made Sagar Nagar slum the ideal location to build the Mahesh Foundation Aadhar Community Center, which provided the women and their families with access to basic services and income-generating activities. 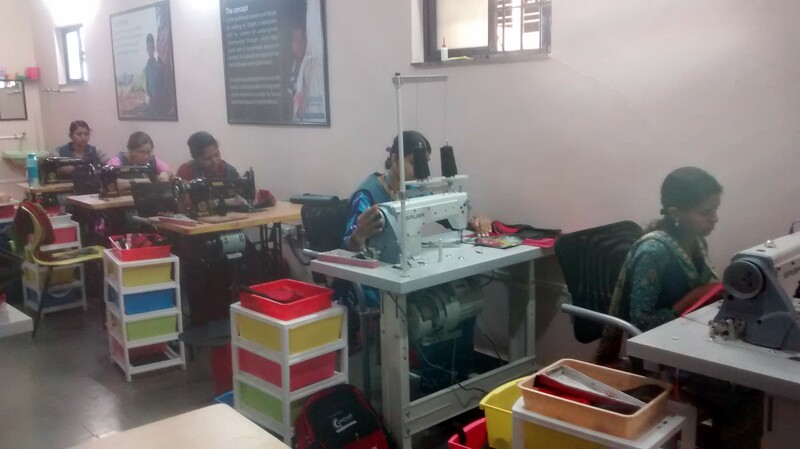 S3IDF collaborated with the Mahesh Foundation to develop and pilot a livelihood skills training unit for women at the community center, to help them become economically independent. The livelihood training taught and employed women to make school bags, which the women were able to sell at a profit to partners like the Rotary Club and Syndicate Bank. The revenue from the sales of the thousands of bags was re-invested into the women’s enterprise, further supporting their business. As a direct result of the training and support provided by S3IDF and Mahesh Foundation, the women are able to make a stable income, have access to basic infrastructure services, send their children to school and sustainably provide for themselves and their families.